Dr. Kathy Platoni ’74 recently published three chapters in a book titled, “We Thought We Were Invincible: The True Story of Invincible Warriors” by Dr. Art F. Schmitt. The book, published by AuthorHouse, is a collection of stories that “…chronicles stories of truly Invincible Warriors.” The perspectives range from several Vietnam veterans to Apollo 17 Astronaut Jack Schmitt’s instructor. 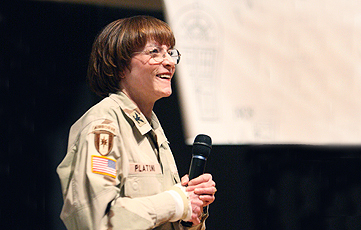 Platoni’s chapters, titled “The War Room,” “Overcoming the Unendurable: Mental Health Warriors in the Trenches,” and “Survivorship in the Wartime Theater: Coping with Adversity of Unthinkable Proportions,” give voice to many of the experiences she has dealt with as a colonel and psychologist in the U.S. Army. This alumna’s own story includes more than 28 years of service, including three deployments – one stateside tour of duty during the Gulf War, command of a Combat Stress Control Detachment at Joint Task Force Guantanamo Bay, and one tour of duty in Iraq. Platoni is an expert in treating post-traumatic stress disorder (PTSD). Her expertise in treating PTSD cases and other topics in clinical psychology has given her voice national attention, and she has been quoted in The Washington Post, Newsweek, U.S. News and World Report, MSNBC and in other local and national publications. Additionally, in 2001, she was deployed to Ground Zero in support of the New York Police Department in the aftermath of the 9/11 attacks. In March in recognition of her lifelong dedication to serving others and for the inspiration she provides for the women who follow her, Platoni was presented with the William Smith Alumnae Association’s Achievement Award for her leadership, courage and service.